The 18th São Paulo Electronic Language International Festival is pleased to present FILE GIF 2017, a selection of 84 works by 18 artists from more than 10 countries. For the first time, the exhibition includes the FILE GIF AWARD, a symbolic award which has been introduced to recognize the quality of the works in GIF format which appear spontaneously in the vast arena which is the internet. In first place is “Gastaloops”, by the UK-based artist Nicola Gastaldi. It is a personal project in which the artist produces 100 GIFs over 100 days, using three colors in 50 gif frames. His award-winning GIF shows multiple perspectives of humanoid figures walking around, busy with their daily routines. The ambience recalls the dream-like engravings of Escher and alludes to the tasks which fill our days and occupy our attention. In second place is “Flora”, by the German artist Philipp Artus. It is one of a series of animations generated by an algorithm which recreates the effect of sine waves found in nature. The resulting images combine the aesthetics of an algorithm with elements of natural flora. Third place goes to “??????? ?”, by the Slovakian artist Adam Pizumy. It forms part of a series of GIFs which the artist has produced from portraits he has appropriated from the internet, which he manipulates in diverse ways to disassociate the images of the faces from their original meaning. Honorable mentions go to “Non-ending layers”, by the Mexican artist Daniel Barreto, who experiments with the rotoscoping technique to illustrate the idea of removing negativity from the body. “Anxiety”, by the Croatian artist Paolo ?eri?, is a roughly sketched black circle which, through its form and repetition, alludes to the infinite. And, finally, “Someone’s Living Room No.2”, from the German artist Thoka Maer. Her animation includes unexpected elements, which she places in a room to surprise and awaken the curiosity of the viewer, encouraging them to consider possible narratives that explain their presence in the scene. These prize-winning works, with the other GIFs on show, refer to the diversity of themes and artistic languages which artists working with the GIF format explore. They address issues of contemporary life, such as our daily tasks, the imbrication between the organic and the artificial, the manipulation of information, of the body, of time and space, through techniques which lend themselves to repetition. FILE GIF 2017 seeks to highlight the multiplicity underlying a presupposition that on the surface appears to be limited, but which unfolds into complexity and variety. 100 animated gifs in 100 days, “Gastaloops” is a personal project built up on some strict rules: 3 colours, looping, 50 frames. Like a visual diary, Gasta played with patterns, optical illusions, objects of daily life, fears, and obsessions typical of London. 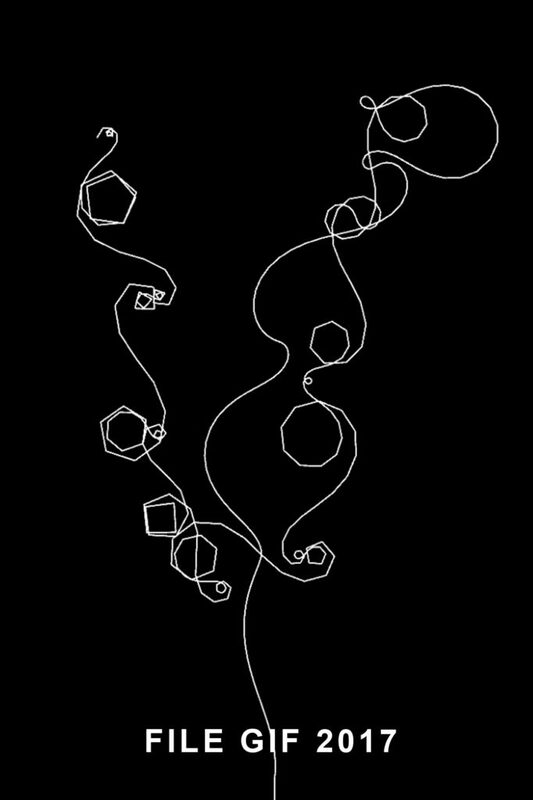 The animation in “Flora” is generated by overlapping sine waves that travel through a string of lines. This wave principle often appears in nature when energy is transmitted through a medium like water, air or simply a rope. The resulting aesthetics combine computational accuracy with an organic playfulness, and tend to trigger diverse associations in the mind of the viewer. The gif was an experimentation with rotoscope animation. First I made a video of myself moving my arms as desired. Then I separated all frames on Photoshop, printed them on a small scale and drew on top of them with different media. The gif was intended to somehow represent myself or anyone who can identify with it taking out all the noise or negativity from the body/mind and just throw it away from the self. In my work I explore the connection between art and science, fields I’ve always been drawn to. I enjoy finding beauty in mathematical formalities which I then use as a source of inspiration and the base of my work. The looping nature of my animations is something of great importance to me since I want to create a feeling of endless motion. Carla Gannis is a New York based new media artist. She is fascinated by digital semiotics and the situation of identity in the blurring contexts of physical and virtual. Gannis’s work has appeared in numerous national and international exhibitions, and has been featured in press and publications including ARTnews, The Creators Project, Wired, FastCo, Hyperallergic, The New York Times and The LA Times, amongst others. Clayton Shonkwiler is a mathematician and artist. He received his Ph.D. from the University of Pennsylvania and is an Assistant Professor of Mathematics at Colorado State University. He is an expert on random knots, and started creating animations as part of his research. His art is still often inspired by his research or teaching, but it has also taken on a bit of a life of its own.